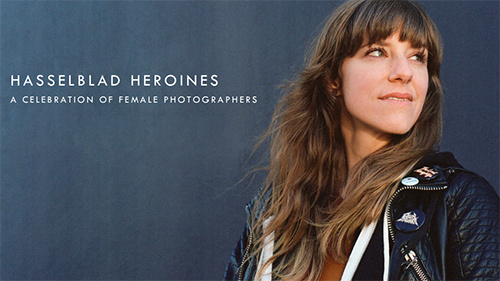 mikepasini.com | Photo Corners | Hasselblad Spotlights 'Hasselblad Heroines"
Hasselblad has concluded the first installment of its Hasselblad Heroines, a series of profiles of women photographers updated weekly. In each piece the featured Heroine shares her experiences, tips and inspiration with fellow photographers. "We created the Heroines features to add depth to the variety of experiences and perspectives we share in our channels. We hope these stories offer both inspiration and insight to other photographers looking to master their work," said Sarah Martzloff, Hasselblad social media manager. Pei Ketron, a travel and commercial photographer based in San Francisco, Calif.
For more information see the news release below and visit the Hasselblad Heroines site. Hasselblad Heroines shines a light on female photographers as they make their mark in what has been typically referred to as a male-dominated industry. Initiated on March 8, on International Women's Day, Hasselblad Heroines was created to focus on celebrating and highlighting the achievements of female photographers worldwide. Through weekly spotlights, each Heroine shares their experiences, tips and inspiration with their Hasselblad to fellow photographers. Hasselblad will conclude the first installment of the series today with a total of nine featured female photographers. Included in the series are Pei Ketron, a travel and commercial photographer based in San Francisco, Calif., Shelby Knick of Los Angeles, Calif., who focuses on adventure and automotive photography, 2018 Hasselblad Master Tina Signesdottir Hult from Norway, who specializes in fine art, portraits and conceptual themes, Cooper & Gorfer, comprised of artists Sarah Cooper and Nina Gorfer based in Gothenburg, Sweden, with their work focusing on the female aspects of cultural identity, Anna Devís, a trained architect living in Valencia, Spain who concentrates on creative, conceptual photography, 2018 Hasselblad Master Kamilla Hanapova, a photographer based in St. Petersburg, Russia who has a passion for portrait, beauty and architecture photography, Seattle, Washington-based wedding photographer Kristen Marie Parker and Hasselblad 2018 Master Slovakian photographer Maria Svarbova, who focuses on space, color and atmosphere. Find all of the Hasselblad Heroines' stories, images and video interviews here.